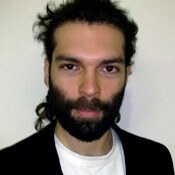 Vangelis Legakis studied dance theatre and choreography at the Laban Centre in London. Since 2004 he has been visiting regularly The Forsythe Company with which he performed in 2006 'Human Writes' in Frankfurt. Also he danced pieces by Lea Anderson and Scott Smith as well as he has been performing in his own choreographies. He has formed The Van - L Dance Company with which he has been touring his productions in Europe. His choreographies include 'The Beginning of Something', 'Aphanisis', 'Octave Stance', 'In Between and Around Liminal Places', and 'En-Pour -Soi' (In-For-itself) have been performed so far in UK, Denmark, Belgium, Albania, and Greece. Vangelis has strong influences by Rudolf Laban, William Forsythe, Skinner Releasing Technique, diverse martial arts techniques, philosophy (phenomenology), and neuroscience through which he has originated new ways to approach dance practice and choreography. This has led him to create his own dance language and a methodology for creating dances - Methodology of Transcendental Choreology. He has participated in research projects with neuropsychologists working on EEG bio feedback for enhancing performance and has been researching rigorously, as well as applying in his work, the affects and effects of emotions and feelings to improve performative aspects.